Though only in a really posh one in London. Judging by more recent events, it appears the traditional method of buying your new car could be on the way out at some point. Some carmakers, for instance, have set up showrooms without any sales staff in shopping centers, and some companies let you agree upon a sales price for your next set of wheels without even setting foot in a dealership! Now, as Caterham handily demonstrates, it's possible to buy your next car from a department store. Admittedly, this isn't just any old store that Caterham's setting up shop in. 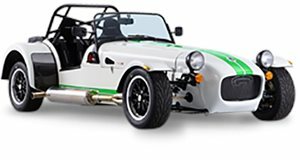 The establishment that you can now buy Britain's most iconic kit car from is Harrods, the world famous department store based out of the extremely high end district of Knightsbridge in London. Considering Harrods' prestigious status, it's perhaps no surprise to know that it isn't just any Caterham Seven that's being sold exclusively through the outlet. Instead, a bespoke 'Harrods Seven' edition - complete with butterscotch leather upholstery, a chassis that's been powder-coated in gold and an asking price of 59,999 GBP (or nearly $75,000 at current exchange rates).